Hide 264 comments... Click to show. best of luck this week!! Good luck mate :) and yeah, i can't wait the end of beta of fanbids page. come back dude!! this community needs u.. I am mad too I am with you buddy. Splooshi was being lazy and only accepted 2 out of my 5 guides and also Advance haven't posted any guides that I have seen on his profile page and won also. Big thanks to Splooshi for putting my guide in place and Exerath for igniting the idea. Here is the finished product.. Ultimate Guide™. I've increased the text size and quality and made a few changes. Rate! RE: Contest Btw I understand your frustration but they were some server issues and also for prizes that big, the entries must be checked & verified properly. I'm sure it will be done ASAP. Please stop asking this on everybody his/her channel. Thanks! You coming back anytime soon? Also sleepdaddy I'll thanks you for your action... really you're a honorous guy! Whooo mate you won this weekly leaderboard contest! 1500 fanbucks ^^ And... i can't believe that you have already reached almost the 1st place in the Lifetime leaderboard! :O Congratz! How did you make 8000 for that short time? Well. I guess its safe to say that you've won this week's contest for sure. lol 5000points only from guides explain me man??????? Ehm a question what is your badge Master Guide smith? comes your avatar from angry birds or? I hear this idea is in the pipeline which be great than just having the weekly leader board. More diverse :) Support! Don't lose your trust in Splooshi, he knows if he's legit and deserves to win or not. I have my full trust in him, so I'm not worrying about spammers/cheaters win :) will you join me? Voi luks like a tuff competition !!! How you get the badge ? How much Credits do you make at 1 week? Wow man How did u get so much funbuks? Nice bro, you won the 1st Place; Gratz! yoooooo xD long time hu? Congratulations for being 1st in the weekly leaderboard contest week 51!! haha Why you didnt tell before? I Thought i was alredy your fan, well i'm now your Fan. YOU Have a Lot of Awesome Guides! grantz u are winner the week. How do you get Master Guide Smith? 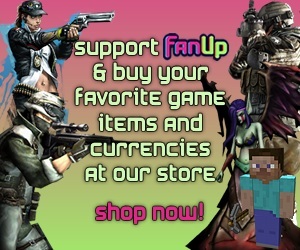 Yo , dude , want to make some extra side cash in order to get your favorite gaming currencies ? check this site out thenhttp://superpoints.com/refer/polish its invite only , let me know if you use the link :D btw fan me too ! :O bad joke :P !!! 2k in funbucks sin hacer 1 sola guia ud piensa q ganara con eso si es asi lo reporto. grtz on coming 1st !!! True. There's a great chance that you are going to win this week's weekly leader contest. Wait for 20 hours and the result will be seen. btw wat do u think of my PC ? As a guardian, please post and comment in appropriate English. Yes. It can ruin everything without typing normally. Just give Splooshi an email about it for deleting, TBH I don't know how to delete guides lol. Yeaaaa I earned the master guide smith badge vohooooo!!!!! Mate we haven't a veteran badge for 2 months! But if you are member for over 2 months so if you think to apply to be a guardian, just send an email to moderator@fanup.com, Of course there is a chance that the admins won't make you guardian. in this case they will explain to you what you are missing :D cheerins! Btw Congratz on 1st... and do u feel getting hit by a car ? vohooo highest ever 1400 fan coins for a guide yessss!!!!!!!! RoyalPork - First Lieutenant 1, RoyalBeef - Sergeant (Sgt.). I play mainly on RoyalBeef now since I want to reach Staff Sergeant 3.
warrock ka kanha se chappha??? Hey, Congratz on the weekly buddy! I guess u r nor gonna appreciate my work so let it be - WTF was that for? AND BTW, since you've said this DON'T GET CRACKED VERSION of photoshop! You already said it, appreciate others' work. dude ns pic, dude, download warrock!! Don't get cracked illegal versions, the creators worked VERY hard on it, just buy it. pagal kisi koh hindi nahi aati so chill, except few!!! No I don't think so .. don't have time to write guides but.. When you make a guide, you will see the formatting options at the bottom. I can't type it here cause it doesn't appear. You have to put strong in brackets before and after the word(s) you want to make bold. Another thing: That guide has a incorrect information: It's old, probably copied. its on the contest,warrock, the strongman report!!! hey. akash check my new video, its not tht gud but still!!! http://www.fanup.com/strong-man-report/screenshot/wooohhoooo, just see this screeshot, hope you'll like it! i read the other comments, i dnt know who goku1996 or whtever he is, i really feel sorry for you, you must have tried quiet hard for getting 150 gcoin??? Stop whine already on FanUp, send an email for Support@FanUp.com for further information, they'll answer and give the reason. I am pretty sure that they do have one! Don't get sad! FanUp is the most awesome thing ever. Hey, you got 1k FanBucks... if you ain't happy, BE IT. Or I IP-track you and send you a Webcam virus, that won't let you access internet until you're happy and like FanUp. Although, I have no idea how to do those things xD Happy FanUpping and keep up the awesome work! Create an account in PHOTOBUCKET.then upload any pic... then move ur mouse over the pic and selecte the link with HTML code (like )and the moving pics are .gif , just use GOOGLE :D , hope i helped ! yeh i was, i try to find things own my own ^.^ gona get the 2nd half ! Hey, trust me, the winners will get choosen in a fair way. If she has to much comments she will defenitly not win. Hello.. Thanks! Ok.. i will report it so they will investigate if there was a violations. ok? Good day..
beat mine :D ? (within 1 month) ? hello i`m new here can u tell me how did u earned so much coins? You probably busted your arm with those guides. quite eager to come first this week hope i do so!! aweeee bad luck m9 is over yea baby!!!!! can i steal ur place??? huh? What are u talkin abt dude who is Akash Das I don't know huh???? Arent u Akash Das ? What can we do with COINS? eheh! Gamerz is back to you so i suggest you to write at least 6 new guides! or you will gain 2nd or 3rd! Mayte... why am i seeing that 4 of your FANS have random names? is absolutely right, you just Worry about making your own guides. splooshi is responsible for reviewing all the guidelines, if accepted is because the guides are good, you should not doubt his decision. guides do large and small, but important content, plus you can write in different languages. have a problem with my guides? if you have any problems please tell me, not other people. guides are small but with an important content, and it is a international forum posting is allowed in any language. My guides are in another language because my English is bad. Come on dude! you can win as many of the users in the top 10 are cheaters or referring fake accounts and will result in disqualifications. So keepup your good work :D and... about AmericaLatina guides: Foreign language guides are allowed but you should make a translation of it. Example: You write in spanish as americalatina, after that you have to write down the guide again but in english. understand? pequeña guias, pero importantes ! I am very far of become Master Guardian, it asks a lot from you. You won't reach it in half a year :P like I am here for nearly more as half a year. Well, You should see a guide as an essay. The bigger it is the better it will probarly be. But do not make a guide full of non-sense stuff. When you make a 3 line guide you will probarly only get like 50 Fancoins and maybe this is a good reason to make a good, big guide so you can reach up to 1200 FanCoins and maybe even higher! The bigger your guides are the more you will be fanned and the more support you give to our community. But you can also just make 3 lined guides but when you make a lot of 3 lined guides you will probarly be seen as a spammer and hey, nobody likes a spammer right. 3 lined guides can better be seen and/or posted as Tips. Have fun mate and feel free to ask anything! i make article rather than guides. A 3 sentence guide can better be a Tip. Goodluck in the weekly competition ;) Remember to have 60% worth of guides! If you do this, then ill start my 25 guides a week again, then you won`t win for sure. Remember not to cheat, have a positive attitude, and have fun making guides! By the end, you won`t even know you won because your having so much fun posting guides to teach others to become better!